NETWORK UPDATE: The changes weren’t enough to make a significant difference, but the entire ABC line-up adjusted up in final ratings, SELFIE and MANHATTAN LOVE STORY each by 0.2 (leaving them at 1.6/1.5), and AGENTS OF SHIELD and FOREVER by 0.1 (1.8/1.4). In addition, NEW GIRL and THE VOICE each gained 0.1, while CHICAGO FIRE lost 0.1. SONS OF ANARCHY (FX) was the night’s easy winner on cable, down just 0.03 from last week to 2.14. TBS’s coverage of the AMERICAN LEAGUE WILD CARD GAME was at 1.71 (scoring a huge 4.01 with men 50+). 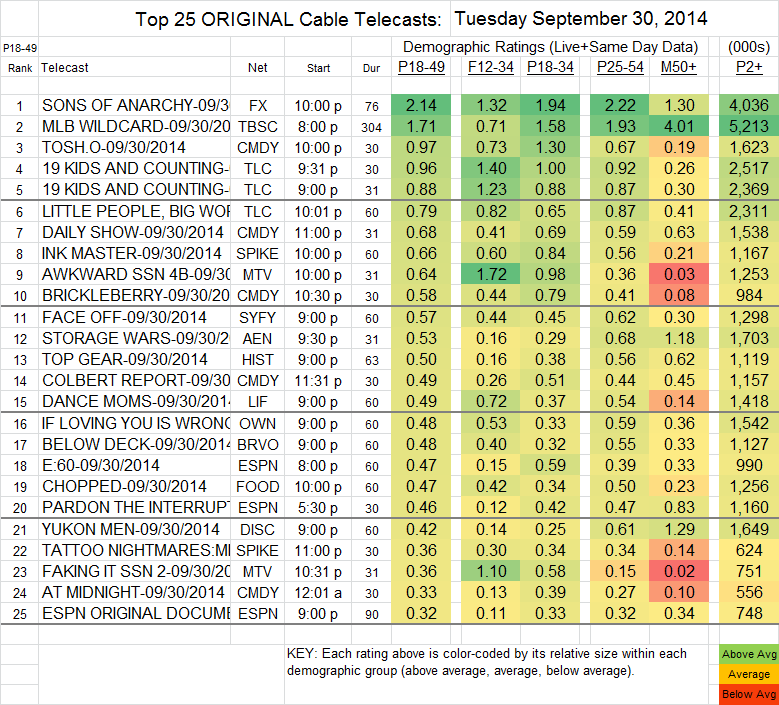 Comedy Central had a good night, as TOSH.0 climbed 0.23 to 0.97, and BRICKLEBERRY rose 0.14 to 0.58. On MTV, the premiere of HAPPYLAND at 11PM was at 0.20 in 18-49s but 0.65 with Females 12-34, and 423K total viewers. It followed AWKWARD, down a bare 0.02 to 0.64, and FAKING IT, which took a bigger 0.15 hit to 0.36. 2 episodes of 19 KIDS AND COUNTING (TLC) were at 0.96 (down 0.05) and 0.88, followed by LITTLE PEOPLE, BIG WORLD, up 0.07 to 0.79. INK MASTER (Spike) was down 0.04 to 0.66, and DANCE MOMS (Lifetime) was up 0.04 to 0.49. HAPPYLAND on MTV at 11:02 pm debuted with 423,000 persons 2+. A 0.20 adult 18-49 rating and 0.65 female 12-34 rating.